In this book, published in 1941, Maulana Muhammad Ali exonerates himself from the allegation that he believed in Hazrat Mirza Ghulam Ahmad of Qadian to be a Real Prophet (Nabi) before the Split in the Ahmadiyya Movement in Islam. Both these stalwarts are still alive. Why does not someone ask them as to whether they were practising deception on people by stating their beliefs to Muslims in this manner? “Allah brought all types of Prophethoods to an end by establishing the Holy Prophet (Muhammad), peace be on him, in the state of the Last of the Prophets (Khatam-an-Nabiyeen)”. Now it is a food for thought that coming to end of all types of Prophethood is admitted; it is also admitted that after the Holy Prophet, peace be on him, there has been no claimant to prophethood except those false claimants who were put to death and now it is proclaimed that the Founder of the Ahmadiyya Movement was a claimant to prophethood. The previous belief of the Qadiani Khalifa Sahib and Qadiani Ulema [clerics] was that they used to state that the word Nabi, has been used as a metaphor and simile carrying its literal lexicon meanings; and they used to deny its application in its Shariah terminological meanings; and they believed that all types of Prophethood has come to an end with the Holy Prophet, peace be on him; and they did not believe in the appearing or coming of any prophet, whether new or old (and now they say that the Founder of the Ahmadiyya Movement was a prophet). Thirdly, above all let us examine as to what was the belief of the Founder of the Ahmadiyya Movement about himself. There is no doubt that he used the word ‘Nabi’ in certain meanings and that in fact was the basis of Fatwa-e-Kufar [pronouncement that a certain person is a kafir or unbeliever] against him in 1891. It is worth considering that when the claim to Prophethood was attributed to him, what was his reply to that? 4. “Can such a wretched fabricator who lays claim to Prophethood and Messengership have any belief in the Holy Quran? What else can be said in clarification; these words are used as metaphor and simile and do not carry real meanings; ignorant, prejudiced people are fabricating a false charge against him by putting real meanings on these words. It is a matter for contemplation for Qadiani Ulema as to who is playing the ‘ignorant prejudiced’ person’s role and whom the Founder is calling a ‘wretched fabricator’; not one or two, but hundreds of such quotations can be cited. They don’t think this much that these words have been written about those persons who had attributed a claim to Prophethood to the Founder; then the deception of the abrogation of writings previous to 1901 was invented. The Founder did not write so anywhere, nor had any Ahmadi ever thought of it before 1914. When Khalifa-e-Qadian invented this in his desire to declare Muslims as Kafir [unbelievers], that the writings of the Founder previous to 1901 have been abrogated. If anyone had known it then, even now any Ahmadi may step forward to state an oath that he had knowledge before the writing of Khalifa-e-Qadian, that a change in the claims of the Founder had occurred in 1901 and all his previous writings on this behalf were abrogated. 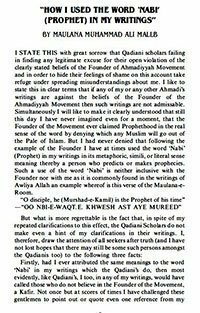 In reply to this deception about change in claims of the Founder a quotation of 1903 which is later than 1901 from the Founder’s book ‘Mwahibur Rahman’ should suffice. The Founder writes at pages 66, 67 of this book under the title of “Some words about my beliefs”. Can there be greater injustice than this that in spite of such clear writings of the Founder, he is being declared a real Prophet. There is no greater misfortune for Ahmadiyya, that its own people are accomplishing about which there was a complaint against opponents.